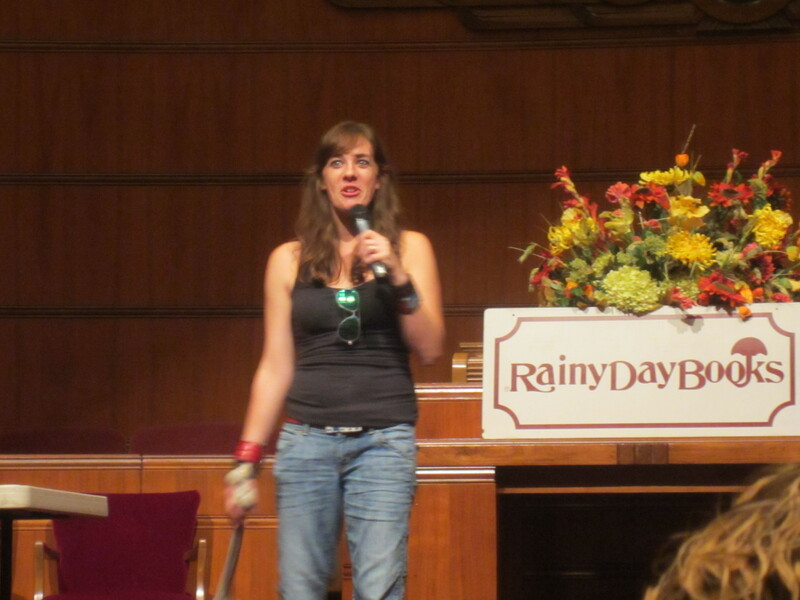 Maggie Stiefvater kicked off the tour for The Dream Thieves in Kansas City with Rainy Day Books at Unity Temple on the Plaza. I love their stained glass windows professing love for books, and that they let Rainy Day Books host author events there so that they can accomodate a larger crowd than the bookstore (though I miss browsing in the bookstore prior to the event). Maggie visited my library (along with Tessa Gratton and Brenna Yovanoff) for the release of Curiosities: A Collection of Stories and proved to be one of the most entertaining authors I’ve ever had the pleasure of meeting, so I was happy that I was able to see her on this tour. 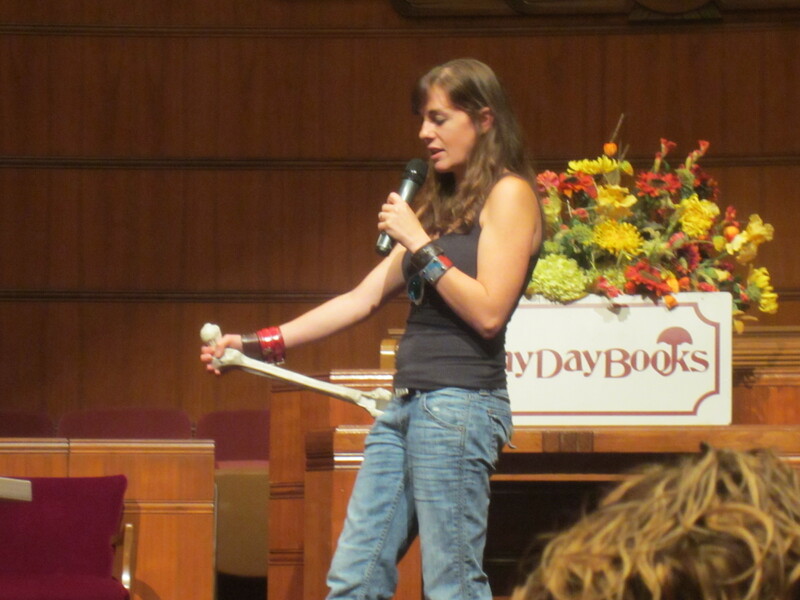 Maggie began by showing us a (fake) skeleton she’d picked up earlier that day and talking about which character from The Raven Boys she most identifies with. Some will guess Gansey because they both drive Camaros. Others, Blue, because they are both girls, but then they realize that can’t be the one because Blue is so practical. People rarely guess Adam, or Noah, but even fewer guess Ronan, who features prominently in The Dream Thieves. 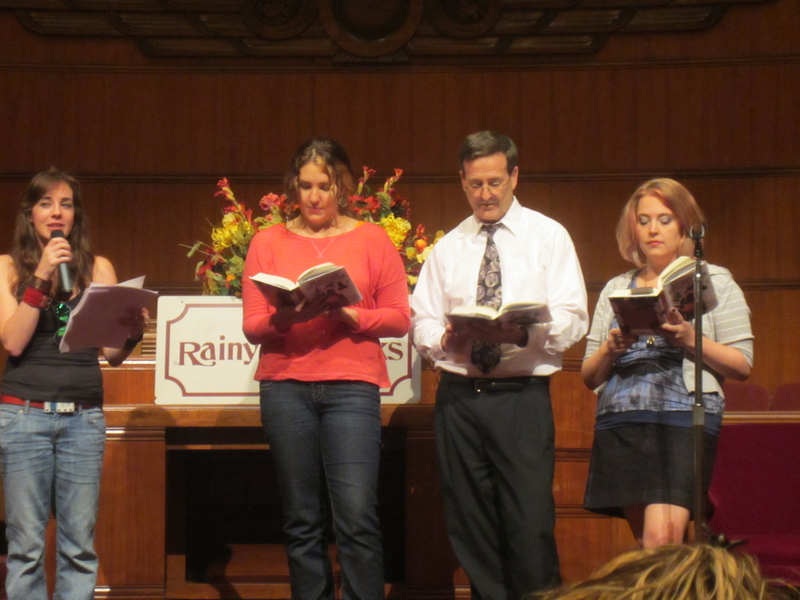 Maggie also treated us to a reading of the scene (which begins on page 108) where Mr. Gray first visits Blue’s house on Fox Way and meets her psychic family. Natalie Parker, Tessa Gratton, and Tessa’s dad joined in the fun. 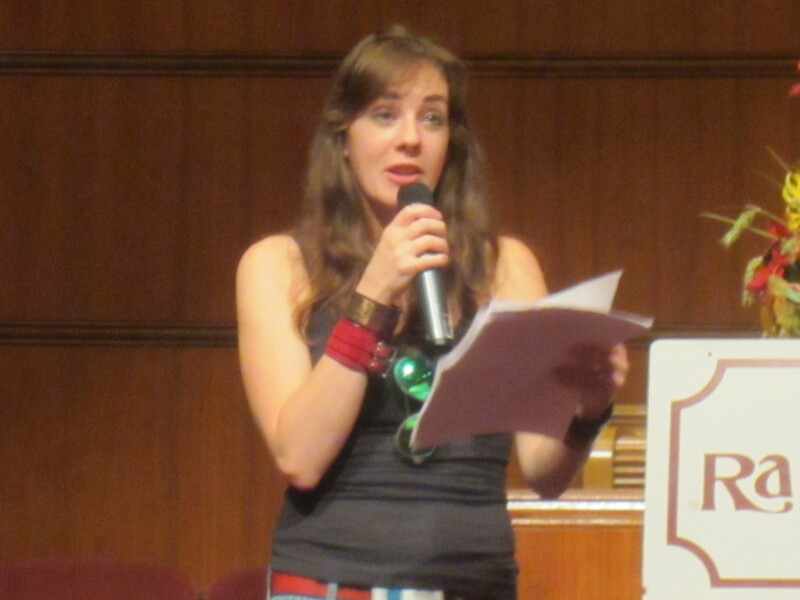 Maggie took many audience questions about her writing process. It was interesting to hear what is the most difficult part for her, which is fight scenes. She excels at atmospheric prose but when she had to write action sequences for the middle grade novel she’s writing as part of Scholastic’s Spirit Animals series she found them to be very difficult. The most exciting tidbit Maggie shared was about her next project, which is a historical fantasy that features time travel, which I can hardly wait to learn more about, let alone read! After she was done taking questions, Maggie has a special project for those waiting for autographs to work on. She’d driven a Mitsubishi to the event and brough several bottles of spray paint an unleashed us on the vehicle, which sports a vanity plate called “thief.” I was one of the only ones who had read The Dream Thieves prior to the event, so I got a kick out of the reference. You can see a video of our vandalism in action here (Mister BS and I are visible in the beginning). This is pretty much the silliest thing I’ve ever done at a book event. I still haven’t finished my review of The Dream Thieves, which is gorgeous and complicated and thrilling and you should definitely read it. I hope to get time to formulate my thoughts soon! Best booksigning activity EVER! Great post Mo. I also loved your banned books post and sent it on to another friend who works at Toronto’s main library. I know, right?! Thanks! I love Toronto’s library…the did this Fahrenheit 451 community wide game that inspired some of the elements in my next big program for the library! I am so behind the power curve, but am reading my first book by this author right now. I’m happy to hear that she’s lively in person – I picture her that way after checking out her blog, etc. Sounds like a great time! Oh, she’s very personable and engaging in author visits. I hope you like her books! I haven’t read the Shiver trilogy or her fairy books, but I love the ones I have read. What are you reading? I actually started Shiver, and though the writing is glorious, the story hasn’t kept me attached. I have so many competing books to read right now that I’m not as willing to stick with something that isn’t holding me… I’m tempted to start the Dream Thieves, though. What do you recommend? Yeah, werewolves aren’t really my thing which is why I never started Shiver. Dream Thieves is my favorite so far. I like The Scorpio Races, but killer water horses are not for everyone. I was there too! How awesome was it that Tessa Gratton and all them got on stage? It was pretty amusing. Maggie is probably one of the amusing and lively author I’ve seen in person.